Kathy See Kennedy '71, writing to a friend about participating in the National Moratorium to End the War in Vietnam, in San Francisco, November 1969. Economic recession, war, struggles for civil rights and women's rights, moon landings, assassinations, mass demonstrations, race riots, drugs, the "generation gap," the pill, great music, conflict and paranoia -- the late 1960s and early 1970s were exciting times of rapid change in America, and we were growing up in the thick of it. Our young voices narrated those times in letters filled with detail, intensity, earnestness, and humor. "I don't have any letters!" Guess what? Unbeknownst to many of us, our college letters were saved by parents and friends, maybe neatly stored away in plastic bags and shoe boxes. As we emailed requests for letters through Whitman's Alumni Office to the classes of 1966 - 1972, we heard back from many alums who regretted that they had tossed out their old letters "in a fit of anti-nostalgia" or in one too many moves. However, we were delighted to hear from others who had discovered buried treasure and were revisiting the days and thoughts of their younger selves . . . folks in their 60s, going back to the '60s! What a trip! Pieced together, these letters written by diverse individuals form a crazy quilt of college life, in a sleepy little town in a nation struggling with contentious historical issues. It was a huge pleasure to have such rich material to work with as we created the script for the Letter Project. Time limitations forced us to cut our initial script by fifty percent, and the performance you can view here on YouTube represents a colorful fraction of the material in the approximately eighty letters which were shared with us. 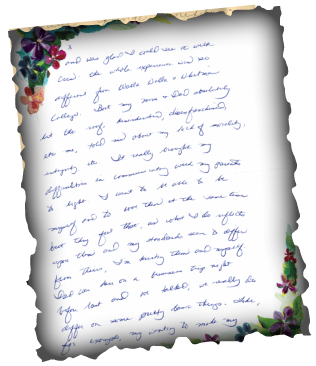 There are many ways in which student letters could be used to assemble an ongoing oral history of student life and times at Whitman and at other institutions. We invite you to participate in the discussion and encourage you to search for and share your own letters.